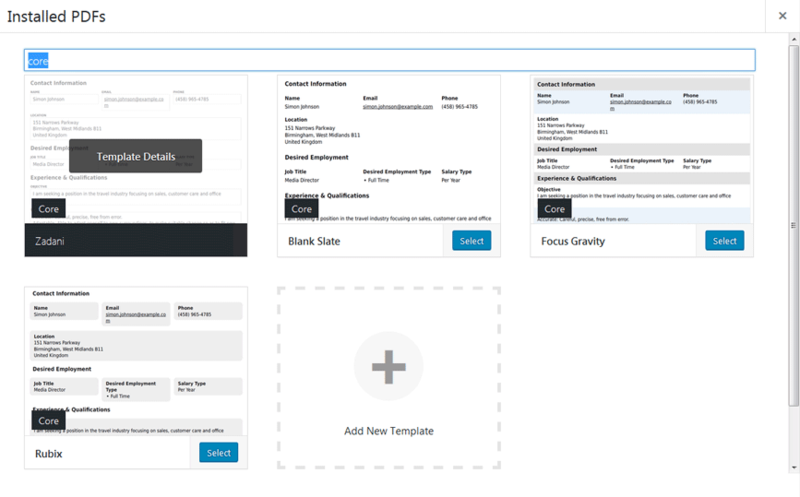 The PDF Template Manager is only available in Gravity PDF 4.1 or later. 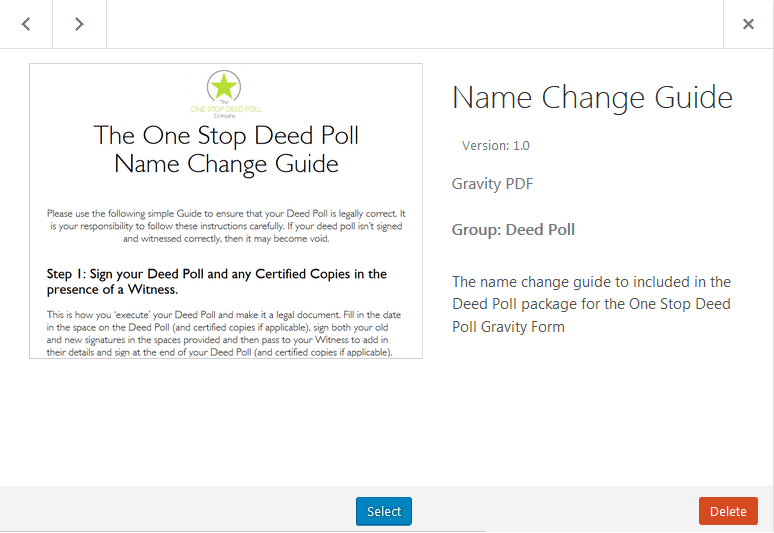 In Gravity PDF 4.1 we added a PDF Template Manager which allows you to better view, search and manage your PDF Templates. Modelled after the WordPress Theme Manager, you can easily search through your installed templates, see what a PDF might look like and view supported features – all without a page reload! We’ve added the ability to install PDFs via a zip file and easily delete them, too. 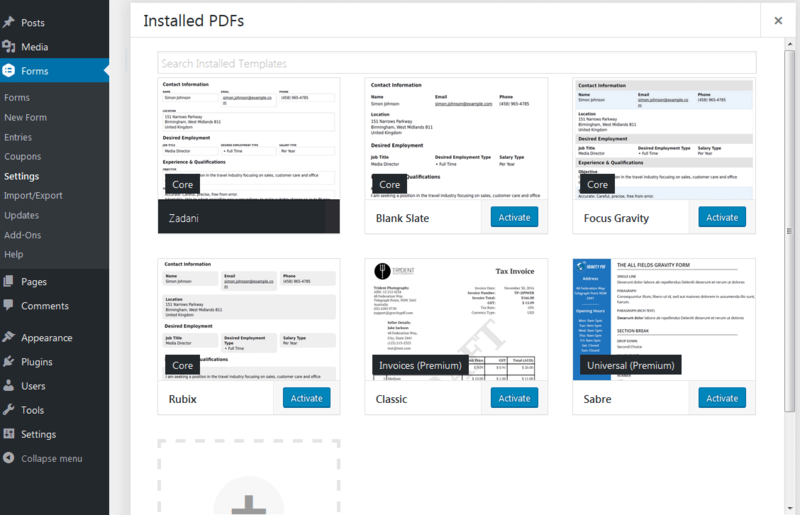 It’s now very simple to install and use custom PDF templates – like the ones you might purchased from our PDF Template Shop. You can access the PDF Template Manager through the Global PDF Settings page or when configuring a PDF on your form. Just look for the Advanced button that will appear next to the Template dropdown box. More information on each PDF can be viewed by clicking (or navigating with your keyboard and pressing Enter) on a PDF image. Once you’ve accessed the PDF Template Manager you’ll see a prominent search bar at the top of the interface. Use it to filter your installed PDF templates – searches are done on the PDF title, description author and group so it’s even simpler to find the PDF you’re looking for. One of the powerful new features is the ability to install PDF Template .zip packages straight from the UI. 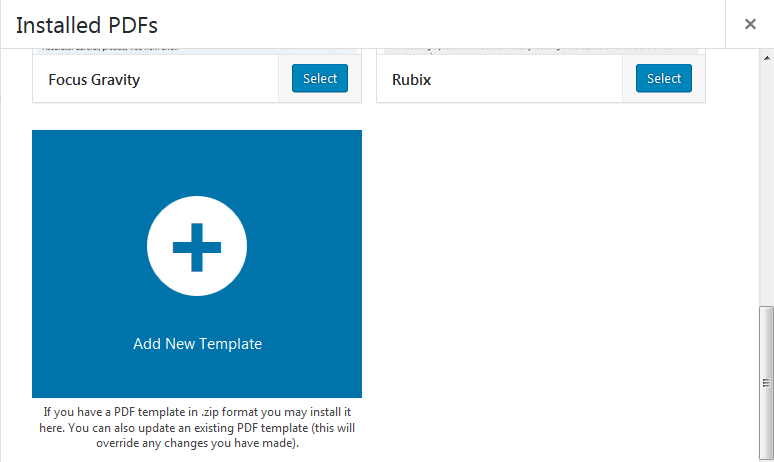 You’ll see an “Add New Template” box below all your installed templates where you can drag and drop your .zip package. This feature is only for PDF Template files that have been created for Gravity PDF. You cannot zip up a document you have on your computer (like a .pdf or .docx) and upload it using the Template Manager. If you purchase a PDF template from our shop the .zip file you’ll receive can be installed through this manager. If a PDF template already exists when you upload the .zip it will be automatically updated (the old template will be overridden with the new one). You’ll lose any changes you make to the PDF template file(s) during an update. If you ever need to delete a custom PDF template you can easily do so via the Delete button when viewing individual PDFs (click the template image to view an individual PDF). You’ll be asked to confirm this action before it deletes anything. Core PDF templates (Zadani, Rubix, Focus Gravity and Blank Slate) cannot be deleted. However, if you’ve modified a core template in the PDF Working Directory you will get the option to delete your modified version.